SAP Crystal Reports is a system that is designed and developed to work in tandem with databases, and to provide users with data to allow for thorough and detailed analysis and interpretation. SAP Crystal Reports simplifies drastically the process of creating simple and even complicated or specialized with its rich set of features and comprehensive tools. With SAP Crystal Reports, presenting data via reports is a breeze. The system not only helps users create detailed and clear reports and presentations, but it can generate reports based on information that is collected from virtually any data source. The system comes with built-in report wizards, guiding users in every step in building reports and completing common reporting tasks. Reports are generated using formulas, cross-tabs, sub-reports, and conditional formatting which not only gives sense to data, but also discovers essential relationships that may otherwise remain hidden. Geographic maps and graphs relay data visually when words and numbers are simply not adequate. Trusted by main organizations across the globe, Crystal Reports has become a very popular report writing tool. The system brings in features and functionalities that enable companies to quickly and easily access essential data found in their databases with queries, and then present it in any number of drillable, multi-page reports: invoices, financial statements, and order forms. This very rich business intelligence application can be fused to a variety of mission-critical applications, enabling users to reach and derive insights from several data sources for complete reporting. Crystal Reports can be leveraged by organizations and companies that operate in just about any industry. Whether these parties are in the accounting, education, HR, manufacturing and real estate sectors, SAP Crystal Reports offers a high degree of flexibility and adaptability. More often than not, the platform is integrated into a larger business intelligence strategy like the SAP BusinessObjects stack. It can be hosted locally, or offered in the SaaS model. Reports created by Crystal Reports can be linked to almost any information source there is. These may also be reports that are representative of client invoices, which support barcodes at the same time. Aside from these, the system is also capable ofgenerating income and revenue reports, giving users an excellent idea of how their businesses are performing. With the ability to create and design professional reports that can be embedded with interactive charts and what-if scenario models, and then distribute these reports via multiple channels such as the Web, email, in PDF or even integrated into enterprise systems, Crystal Reports provides companies and organizations the leverage to create fast, accurate, and deliberate strategic decisions. If you are considering SAP Crystal Reports it might also be beneficial to check out other subcategories of Best Business Intelligence Software listed in our database of SaaS software reviews. Organizations have different wants and requirements and no software solution can be ideal in such a situation. It is pointless to try to find a perfect off-the-shelf software app that fulfills all your business requirements. The intelligent thing to do would be to adapt the system for your unique requirements, employee skill levels, finances, and other elements. For these reasons, do not hasten and subscribe to well-publicized trendy applications. Though these may be widely used, they may not be the perfect fit for your specific needs. Do your research, investigate each short-listed application in detail, read a few SAP Crystal Reports reviews, speak to the vendor for clarifications, and finally select the app that offers what you want. How Much Does SAP Crystal Reports Cost? We realize that when you make a decision to buy Business Intelligence Software it’s important not only to see how experts evaluate it in their reviews, but also to find out if the real people and companies that buy it are actually satisfied with the product. That’s why we’ve created our behavior-based Customer Satisfaction Algorithm™ that gathers customer reviews, comments and SAP Crystal Reports reviews across a wide range of social media sites. The data is then presented in an easy to digest form showing how many people had positive and negative experience with SAP Crystal Reports. With that information at hand you should be equipped to make an informed buying decision that you won’t regret. What are SAP Crystal Reports pricing details? 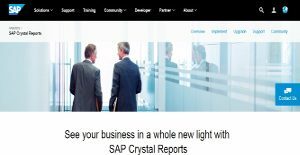 What integrations are available for SAP Crystal Reports? SAP Crystal Reports integrates with a wide range of well-known solutions to add data visualizations, dashboards, and more. If you need more information about SAP Crystal Reports or you simply have a question let us know what you need and we’ll forward your request directly to the vendor.